Text continues from first page. The mountain as cattle head and the trees as horns; the bridges as the four legs and the houses as the body. 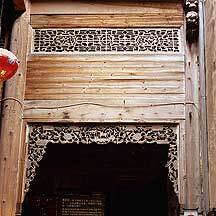 The mountain is the 雷岗山Leigangshan hill; the trees are the two large trees on the village entrance; the bridges are the four old bridges of the village; and the houses are the village houses. 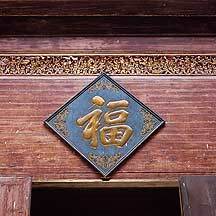 Furthermore, the 月沼Yuezhao (Crescent Lake) is the heart; the 南湖Nanhu (South Lake) is the stomach; and the canals are the intestines. It would be interesting to have a bird's eye view of this cow (I drew a map of Hongcun), although I wonder how many people take these literally. But this legend is a recent one. One that was spread by guides and tourists, and now the internet, during the beginning of the tourist industry here. 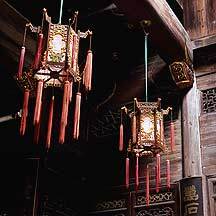 One legend has it that in the 1930s a group of teachers from the 南湖书院(South Lake School) sat by the lakeside to cool off after a few bowls of wine, and during that heavenly spirited moment they sensed the cowness in Hongcun. The only written passage in which "cow-shape" is mention is in a book, 《雷岗山记》"Leigang Hill Records", written by one of the Wangs during the fifth year of 乾隆Qianlong emperor (1744). In the passage the author was admiring the straights and curves of the Leigangshan Hill, which he likens to a resting cow. But there was no mention that the village itself was shaped like a cow. 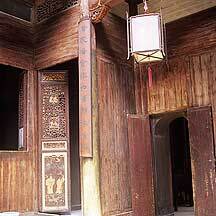 Furthermore, Hongcun already had 340 years of existence. Today, through countless word of mouths, different versions of cows are flying around, with cow heads and horns at different locations. Plus, more cow organs and body parts are popping up. 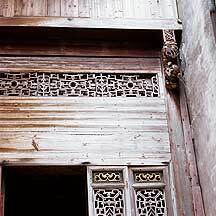 The old village is located on the south foot of the 黄山Huangshan (Huang Mountain) range, and about 11 kilometers northeast of 黟县Yixian County. It is 18 kilometers north from its sister village 西递Xidi (sister because they are always mention together and both share many similar characteristics). Both are designated as world heritage sites by UNESCO in 2000. 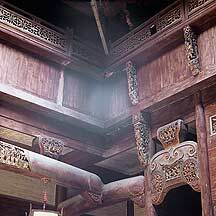 The interior of 承志堂 Chengzhitang, one of the main buildings of the village. 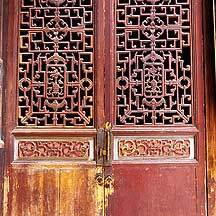 Detail of a wood screen door with lock. 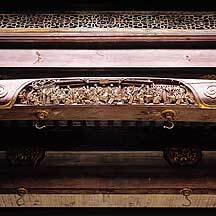 Included in the screen pattern are carved forms of bats, a symbol of good luck. 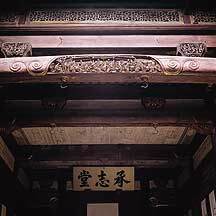 Woodcarving decorations on one of the doorways in a large room. 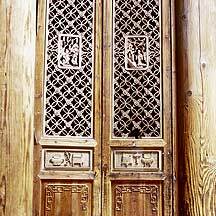 Detail of a wood screen door. 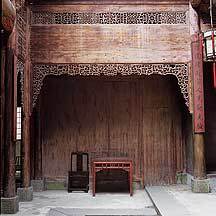 Included in the screen pattern are carved scenes taken from novels or history; also popular are carved objects of things representing wealth, luck, education, or longevity. 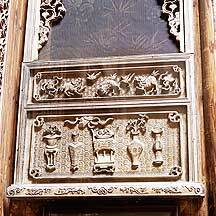 Among the objects are Qilins (unicorns). Qilins are mythological animals of the first order. Their appearances foresee significant events or persons to come. 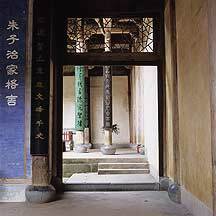 A qilin was said to appear at the birth of Confucius. There is a second level but closed for tourists. I was told that it has wood planks for the floor. 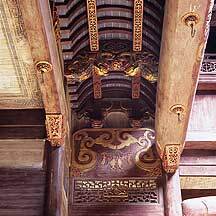 The ceiling are painted with scenes, similar to carved ones on wood. 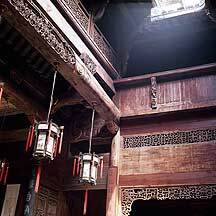 A 门罩 menzhao below an open rooftop. 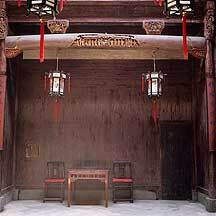 Menzhao are sort of a cover, symbolically to protect what is below. 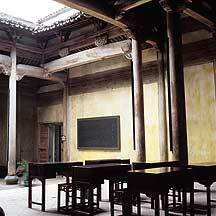 Interor of 南湖书院 Nanhu school. 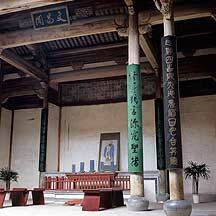 Interor of 南湖书院 Nanhu school. 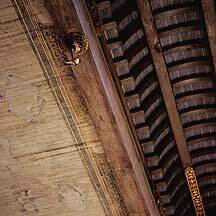 I am not sure the figure in the painting is 孔夫子 Kong Fuzi (Confucious) or the Song Neo-Confucianist philosopher 朱熹 Zhu Xi.